American Cocker Spaniel Characteristics: The outgoing and patient American Cocker Spaniel is a breed of medium sized dog, classified as a member of the Sporting Dog Group (AKC:1884). The American Cocker Spaniel, is characterized by its unusual appearance with short on the head and profuse hair on the legs and abdomen, a refined chiselled head and an appealing expression. Other characteristics include long, lobe-shaped, rounded ears; a short, compact body and a powerful, coordinated gait. The temperament of the American Cocker Spaniel can be described as Sociable, Trusting, Even Tempered. The coat type of the American Cocker Spaniel is described as medium, silky coat in assorted colors. Due to its characteristics and qualities, the American Cocker Spaniel demonstrated the desired traits of a Bird Flusher and retrieving dog and is known by its nick name the "Lady and the Tramp dog". The origin of the American Cocker Spaniel dog breed was in United States where it was developed in the 1800's. 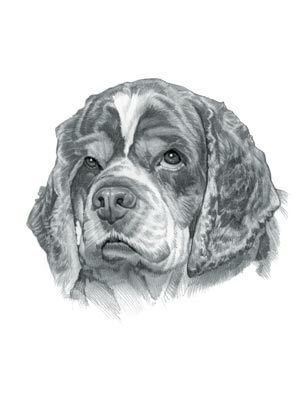 American Cocker Spaniel Breed Group and Dog Type - Sporting Dog Group (AKC:1884): The American Cocker Spaniel is one of the many breeds of dogs that belong to the Sporting Dog Group (AKC:1884). Other names for the American Cocker Spaniel: The American Cocker Spaniel is known by the nickname of the "Lady and the Tramp dog". Other names for this breed of dog include the Cocker, the Woodcock pigeon hunter, Cocker Spaniel and the Merry Cocker. Origin of the name: The word "Cocker" relates to the English heritage of the dog and its use of hunting Woodcock pigeons. The name 'spaniel' originated in Spain and referred to a surname meaning "Spaniard". It was then transferred as a name for a breed of dog supposedly of Spanish origin. The spaniel breed was extensively developed in different countries during the 1600's, but the name retained its Spanish association. American Cocker Spaniel History and Origin: The country of origin of the American Cocker Spaniel breed was in United States during the 1800's. The Cocker Spaniel was bred to use air scent to assist humans as a Hunting Dog to flush and retrieve birds, especially the woodcock pigeon and also small game. The Cocker Spaniel dog was trained to direct, or point the hunter to the quarry and the hunter then used weapons or nets to catch the birds or animals. The Cocker Spaniel also aided the hunter by startling, or flushing, birds from their cover. The American Cocker Spaniel descended from the English cocker spaniel but dog breeders in the United States developed the breed to a different standard, which enabled it to specialize in hunting the American woodcock, aka the timberdoodle, a game bird of the sandpiper family that resembles a snipe as a successful Bird Dog (Gun Dog). The popularity of the American Cocker Spaniel increased significantly following the release of the 1955 Disney move 'The Lady and the Tramp'. The American Cocker Spaniel was officially recognized by the American Kennel Club (AKC) in 1884. American Cocker Spaniel Modern History: The modern history of the American Cocker Spaniel moved on and the breed is now enjoyed as an affectionate family pet and companion. During the 1990's dog breeders began to combine the attributes of the Cocker Spaniel with other breeds to develop the so-called 'Designer Dogs'. The Cocker Spaniel was cross bred with the Poodle to produce the Cockapoo and the Cocker Spaniel and the Yorkshire Terrier were cross bred to produce the Corky. The American Cocker Spaniel is suited to life as a family pet or a working gundog. American Cocker Spaniel - The Lady and the Tramp: The 1955 Disney Movie, the Lady and the Tramp, tells the story of a refined female American Cocker Spaniel called "Lady" and her adventures with a street wise mutt called "Tramp". The American voice actress Barbara Luddy supplied the voice of Lady. The 'Lady and the Tramp' remains one of the most popular kid's movies of all time and the cartoon character "Lady" is the most famous American Cocker Spaniel in the world. American Cocker Spaniel Height: The American Cocker Spaniel breed is classified as a medium sized dog. The height to the shoulder of a male dog is 15-16.5 inches (38-41 cm). The height to the shoulder of a female dog is slightly less. American Cocker Spaniel Weight: The weight of the male in this medium sized dog is 15-30 pounds (7-14 kg). The weight of the smaller female dog is slightly less than the male. American Cocker Spaniel Coat Type: The coat type is described as medium, silky coat. American Cocker Spaniel Coat Colors: The colors of this dog breed consist of assorted colors consisting of Black, Red, Brown, Tan, Silver, White & Buff and Tri-color. N.B. The term "Red" refers to reddish shades of orange, brown, and tan colors. American Cocker Spaniel Grooming - MODERATE Grooming Needs: The dog grooming needs of the American Cocker Spaniel is not extensive and therefore categorized as Moderate in order to maintain a healthy coat, reducing the risk of skin infections. The modest grooming needs of the American Cocker Spaniel is considered to be mid-maintenance requiring weekly brushing and combing. Dog Grooming Requirements should include bathing the dog on a monthly basis and making regular inspections of the teeth, eyes, nails and ears. American Cocker Spaniel Litter Size: The litter size of this dog breed ranges from 4-7 puppies. American Cocker Spaniel puppies for sale can be obtained reputable breeders and from rescue centers. The cost of American Cocker Spaniel puppies varies depending on location, pedigree history and the dog breeder. American Cocker Spaniel Temperament and personality: The temperament and personality of this popular dog breed is described as Outgoing, Sociable, Trusting, Even Tempered and Patient. American Cocker Spaniel Exercise Requirements: The exercise requirements of this breed of dog are moderate. The American Cocker Spaniel requires regular daily exercise consisting of about one hour every day. This medium sized dog has a powerful, well coordinated gait with strides of a moderate length requiring a steady walking or jogging speed by the owner to meet the dogs exercise requirements. If the dog has more energy than you do, then teach your dog to play ball in a chase and catch game. American Cocker Spaniel Diet: A fully grown American Cocker Spaniel should be fed twice a day. A diet consisting of a premium dog food can be balanced with fresh food eaten by the family. The question is What Can Dogs Eat?. Check out our comprehensive list of what dogs can and what dogs cannot eat. American Cocker Spaniel Health Problems: Potential health problems of the American Cocker Spaniel breed include Eye Infections, cataracts, Ear Infections. Resolving health problems can prove to be expensive and it is always wise to obtain pet insurance or dog health insurance when buying a dog. Is the American Cocker Spaniel dog breed said to be Hypoallergenic? Answer: No. American Cocker Spaniel Lifespan: The life expectancy of dogs vary according to the size, breed of dog and any serious health problems. The typical lifespan of the American Cocker Spaniel breed is 12-15 years. American Cocker Spaniel Male Dog Names: Male Dog names are most often chosen to reflect favorite names of the owner or the strength, size, coloring and country of origin of the American Cocker Spaniel breed. To give you some inspiration regarding good male American Cocker Spaniel names our small selection might be of help with naming boy dogs. Our top male dog names for the American Cocker Spaniel are: Bruno *** Chester *** Spike *** Gaius *** Josh *** Kenan *** Simba *** Baruch *** Toby *** Duke *** Lucky *** Ben. American Cocker Spaniel Female Dog Names: Female Dog names tend to be softer, prettier and reflect the temperament of the girl dog. Our top choice of good female American Cocker Spaniel names are Vesta *** Cupid *** Romy *** Vicki *** Rina *** Ceres *** Cleo *** Honey *** Cassie *** Crimson.